December 1st, first day of the last month, and also my birthday. To celebrate, Nicole and I headed North to Seoul for a much needed vacation. Neither of us had visited Seoul since the Color Me Rad Weekend months before. Nicole and I left Gwangju Saturday morning via the bus terminal. We arrived in Seoul early in the afternoon and made our way to Itaewon, for some delicious sandwiches, Sam Adams, and Dr. Pepper. This might sound like an odd combination, but it comes with the territory. Korea only imports certain things and the selection seems pretty random. For example, Dunkin’ Donuts and Popeyes Chicken are everywhere, yet, there aren’t any McDonald’s in Gwangju. After lunch, Nicole and I wandered around Itaewon in search of stamps. I had a lot of postcards from Japan that I had never got around to actually mailing. My quarter-century anniversary of being alive seemed an appropriate time as any to use the Korean Postal System. Nicole and I managed to track down a little shop selling stamps and purchased 14 stamps to send postcards home to family and friends. On the way to the mail box, we also found a delicious cookie place called Ben’s Cookies and picked up some awesome cookies. After cookies and stamps we went to this shop called High Street Market that specializes in foreign food. They ship in foreign beer, cheese, meats, Kraft macaroni & cheese, and a plethora of other hard to come by foods. I bought some vegetarian chili and Nicole and I bought two Rogue beers to share. Nicole and I tried to find a place to stay in Itaewon that night, we wandered up and down the main street and stopped in a few hotels. Itaewon has a few western-style hotels, but, as Nicole and I found out, they also come with western-style prices. 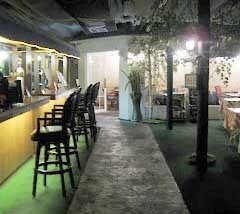 We decided to return to the hostel we stay at every time we visit Seoul, but to our dismay the hostel was booked. Many foreigners visit Seoul (and specifically Itaewon) on their weekends to indulge in their western guilty pleasures of good beer and delicious tacos. Dejectedly, Nicole and I decided we would get a hotel in a different part of Seoul, but not before satisfying Nicole’s appetite for western diner food. There’s a place in Itwaewon called Richard’s Copycat Diner. It was created by a Korean chef who visited New York and fell in love with a particular diner. When he moved back to Korea, he opened up a restaurant with an identical menu and called it Richard’s Copycat Diner. We walked over to the restaurant and stopped in for a bite to eat only to realize that it was closed for the next two weeks for remodeling. The entire restaurant was under construction and the door was left unlocked. Nicole and I took a peek inside and walked around. It looked like a nice place. I unfortunately slipped in some wet cement and may have left a footprint in the cement. If you visit Richard’s Copycat Diner and find a mysterious footprint, it probably belongs to me. One would think that being without a place to stay AND finding out that your potentially favorite restaurant was closed would leave us crushed, however, we persevered. I remembered Mary and Joseph were turned down by every Inn in Bethlehem and they ended up giving birth to a baby Jesus. 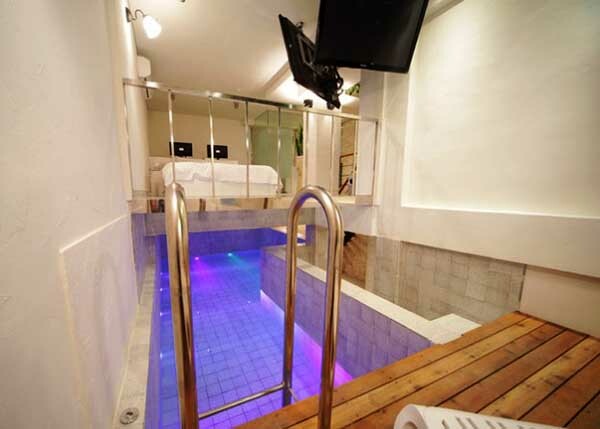 Since Nicole and I were turned down by every hotel in Itaewon, perhaps something miraculous would happen to us. As long as it didn’t involve giving birth to a savior, I was on board. In Sinsa-dong, Nicole and I stopped at a few love motels and were turned away at each one. With all this hotel rejection, I was certain we were going to give birth to a baby Jesus at any moment. Bizarrely enough, the hotels kept telling us that they were full and that we should come back in two hours. Apparently people rent out their hotel rooms to guests for a few hours for parties…or other things. Some of the rooms even come with private pools and bowling alleys. Although we couldn’t find one on this particular trip, I know what we’ll be doing on our next trip to a love motel in Seoul…bowling! Nicole and I bided our time in the park nearby enjoying our Rogue beers like homeless people until out of nowhere a dozen ninjas ran into the park… or maybe they were just Korean teens, dressed in black, practicing parkour…. either way it was the perfect way to enjoy a park at night. After we checked in, the two of us headed out to Hongdae to enjoy fine beers. For my birthday, Nicole found the best bars in Seoul and luckily they were nearby. Before we made it to our first stop, we found an old-school shooting gallery off a side street. Nicole and I got pretty good at that shooting game, like, potential assassins good. 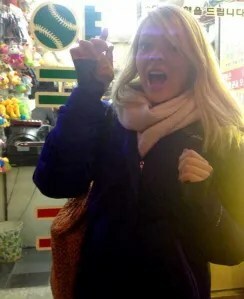 Nicole even won a free poop keychain. That’s right, a keychain stuffed animal of poop. After the shooting range we stopped into Oktoberfest, a neat little German beer hall in the basement of a nondescript building. It reminded me of the Hofbrau Haus in Germany and my Europe trip. While the place wasn’t an exact reproduction of the famed Hofbrau Haus, because there were no pretzels and everyone was Korean, it was pretty close. Nicole and I each got a beer. I got the Dunkel and she got the Hefeweizen in classic Austin and Nicole fashion. At the front of the beer hall was a waiting area where Nicole and I noticed a man passed out sitting on the couch. We’d become used to seeing sights like this in Korea. It’s not unusual to see people stumbling down the road at odd hours of the night or day, clearly drunk. I don’t see it as much in my neighborhood, but it’s more common in Nicole’s neighborhood. 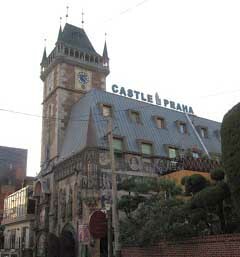 After Oktoberfest, we checked out Castle Praha, the sister bar to Praha in Itaewon. The entire building inside and out looks like a medieval castle. Walking inside feels like being transported into Europe. The beer was delicious, the atmosphere was enchanting, and there were no drunks passed out in the lobby. After Castle Praha, we stopped to get my favorite guilty pleasure in Korea. Please don’t judge me too harshly for this, but there are certain stupidly silly things that living in Korea causes me to miss. One such thing is the Crunchwrap Supreme from Taco Bell. I’m told there are only 3 Taco Bells in Korea, and all of them are in Seoul. 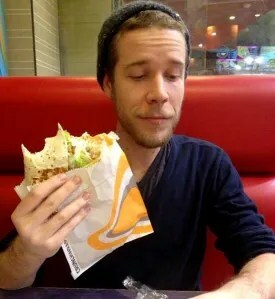 Every time we have traveled to Seoul, I have eaten a Crunchwrap Supreme, and I plan to uphold that tradition well into the future. This was a great first day of my birthday weekend. Nicole did an awesome job planning a great weekend and it was only halfway over. The next day we visited…Lotte World! !